Escape to a serene setting on the Williamette River infused with Portland culture. Sense the vibe in the cuisine, design and décor, and Mount Hood and downtown views. Find comfort and style in over 500 rooms and suites, but elevate your experience by upgrading to concierge-level accommodations for access to the M Club. There enjoy a lounge/work space, bar with refined selections, snacks, HDTVs, iPad use, hot breakfasts, and free Wi-Fi. Back in your room, appreciate the thoughtful modular furniture design giving you flexibility to transform the space to suit your needs. Savor the 100-mile menu (curated and sourced within 100 miles of the hotel), 150 whiskey selection, aged-barrel bourbons, and extensive wine lists. Chef kitchen parties entertain with interactive demonstrations. The 44,104 square feet of total meeting space provides an impressive canvas for Meetings Imagined planners to make your event unique. 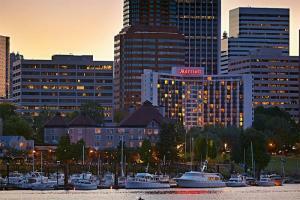 The award-winning Portland Marriott Downtown Waterfront is upscale with a laid-back sensibility. 60 breweries, the Oregon Convention Center, Oregon Zoo, Keller Auditorium, RiverPlace Marina and Portland State University.